You want your dog to maintain a healthy weight, and this means striking a balance between making sure that your dog isn't overweight or underweight, and this can be tricky if your dog has trouble gaining weight or keeping weight on. Dogs tend to be overweight, so it's important that you monitor their weight and adjust the food accordingly. Finding a high calorie dog food can be overwhelming if you don't know what to look for or if you've never had to buy it before. 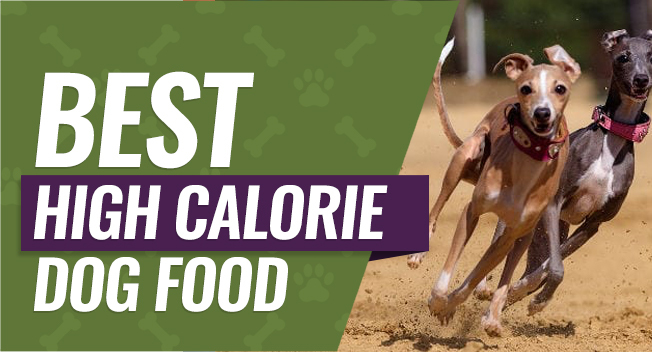 We've rounded up the top five calorie rich dog foods, and we'll also cover how to tell if your dog is overweight or underweight, and what could cause it. There are several reasons why your dog may need a dog food that is rich in calories. These reasons range from simple to more complex, you most people have a good idea on which one is affecting their dog. Age: When your dog starts to age, and near their senior years, they may start to lose their muscle mass and lose weight. A diet of dog food with a rich calorie content and a great protein source can help to combat age-related weight and muscle mass loss. Dental Problems: If your dog's mouth hurts or if it's infected, they won't want to eat because it causes them pain when they do so. Poor eating habits combined with dental problems like abscesses or broken teeth can contribute to weight loss. Excessive Exercising: Some dog breeds like border collies or working dogs have fast metabolisms or high energy, and they can lose weight if they don't eat enough calories every day to make up for what they burn. By eating a higher calorie diet, they'll keep their ideal weight. Health Problems: Some dogs can develop health problems that make them want to eat less, or they can be so nervous or anxious that it puts them off their food. If this is the case, you need to make everything they eat count when it comes to calories because it can help stop them from getting very underweight. Parasites: Internal parasites like tapeworms can wreak havoc on your dog's weight, and you may see your dog losing weight at an alarming pace. Feeding your dog a calorie-rich diet can help, but you'll have to treat the parasite infection as well to get lasting results, or your dog will continue to lose weight. Picky Eaters: Some dogs get very picky when it comes to the food that they'll eat and what they won't eat. You'll have to try several brands or flavors until you find one your dog likes, but you want to make sure that you're testing nutritious and nutrient dense foods, so they don't lose more weight. There are several things that you can do to check your dog's weight and see if they're underweight, overweight, ideal, or listing to one extreme to the next. Stand and look down over the top of your dog while they're standing to get a good idea on which category they fall into. Your dog's ribs, spine, and hips are very prominent, and you can see them very easily if your dog has a shorter coat. Your dog won't have any visible body fat, their waist will be very obvious, they can look sucked in because they're so thin, and they may have muscle mass loss. Your dog's spine, ribs, and hips are very easy to see when you look at them, and you can see all of their ribs when they stand still. Additionally, you'll be able to see your dog's hip and shoulder bones when you stand above your dog and look down at their profile. You should be able to feel your dog's hips, ribs, and spine but not see them unless your dog is turning and twisting around when they're playing. Your dog's body should tuck in slightly after their ribcage ends, and they should have a slight waist when you look at them from above. Your dog is officially overweight if they weight between 10 and 20-percent more than their ideal body weight, and they should look very broad when you look at them from above. You'll be able to see fat deposits on the base of the tail and belly, you won't see your dog's ribs, and their waist starts to disappear. Your dog is obese if they weight more than 20-percent of their ideal body weight, and this is the point where you can't see their ribs, and it's difficult to feel them because of the thick fat layer. Your dog will have fat rolls around their neck, a drooping belly, and fat deposits on the base of their tail. If you're still not sure where your dog's current weight falls, you can use this breed chart to get an approximate ideal weight for your dog. Additionally, this healthy weight calculator will give you a good idea on where your dog is on the chart, and you'll also get an approximate daily calorie count you need to feed your dog to reach your dog's ideal weight. Keeping your dog in good shape and at a good weight for their breed can help keep them healthy throughout their lives. Additionally, it can help lower the chance that your dog develops more serious health problems like diabetes or respiratory issues due to the excess weight. You also want your dog to have healthy layers of muscles because their muscles act like a layer of insulation that can help prevent injuries to your dog's bones and joints. Muscles also help to support your dog as they move around, and this is especially important if your dog is older and has arthritis because it can lower the amount of discomfort they feel. 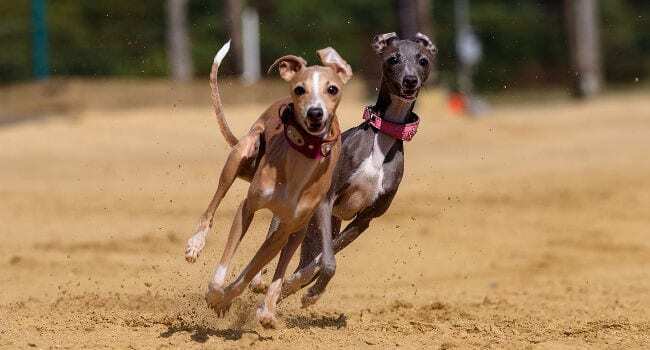 Finally, you want your dog to live as long and as healthy of a life that they possibly can, and watching their weight can go a long way to increase their longevity. They'll be able to be more active well into their senior years, and you'll get to enjoy your furry friend's presence longer. Real meat from a high-quality protein source is the first ingredient listed on this label, and it is developed to be rich in protein and amino acids to encourage strong and lean muscle growth. Your dog will enjoy high protein ingredients, minerals, vitamins, vegetables, fruits, and antioxidants to encourage weight gain. This dog food is also designed to be easy for your dog to digest and it's supposed to help balance out the bacteria in their digestive tracts because it contains probiotics along with no grains, filler, wheat, or corn. This food is held to very high quality standards, and it's made in the United States. People who bought this food for their dog found out that it worked very well for dogs with digestive issues that can cause them to have difficulty gaining weight, and they also found that there were several flavors to keep their dogs interested. Dog owners weren't happy that this food can have a strong smell associated with it, or that the pricing of the food isn't consistent and tends to fluctuate. Your dog will get a quality protein source as the first ingredient that combines with fruit, vegetables, and whole grains for a balanced and nutritious dog food that will help your dog gain weight. 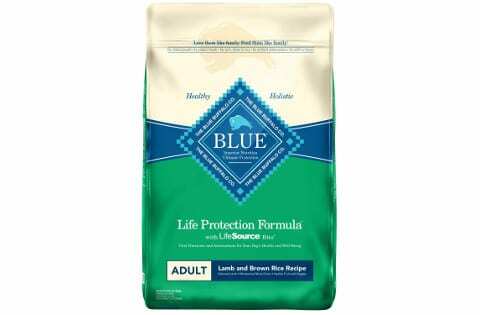 This food also contains Blue LifeSource Bits, and these Bits contain high levels of antioxidants, minerals, and vitamins to support your dog's immune health and life stage requirements. 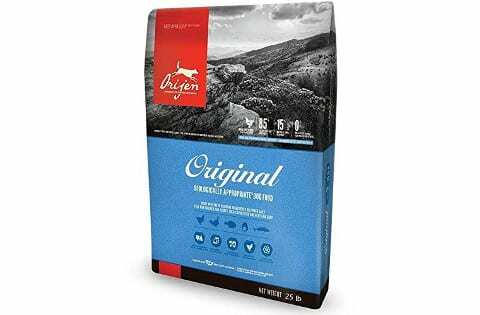 This blend is easy for your dog to digest because it contains no soy, corn, by-product meal, wheat, artificial preservatives, or artificial flavors. Your dog will get a good dose of Glucosamine to support their bone and joint health at each meal, and they'll also get vital Omega-3 and Omega-6 fatty acids to promote healthy skin and coat. Dog parents loved that this food is formulated with Blue LifeSource Bits that give their dogs a needed boost of antioxidants, vitamins, and minerals as well as fatty acids and high protein to support healthy weight gain. Dog parents weren't happy that this dog food formula had a harder kibble that seemed difficult for their dog to eat. 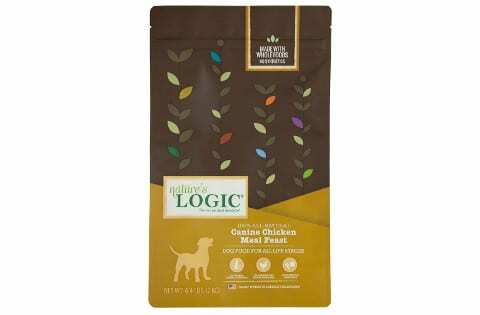 This dog food is meant for dogs who have trouble keeping weight on and dogs who have sensitivities because it has limited ingredients and single protein source. This food is lightly freeze dried when they package it to help lock in all of the nutrients possible from the wild caught salmon and tuna, free range turkey and chicken, and eggs. Your dog will get servings of fruits and vegetables each time they eat this food, and this is combined with vitamins, fatty acids, high protein content, minerals, and more to support your dog's complete health. There is no grains, fillers, byproducts, or unhealthy mystery ingredients that can cause your dog to have an upset stomach or not eat and lose weight. Dog parents who bought this blend for their dogs were happy that it has limited ingredients with a high protein content, so it's good for dogs with sensitivities or allergies, and they also liked that they found fruits and vegetables. Dog parents weren't happy that this food blend's price went up recently, and they also weren't pleased that it took a while to transition to this food. You can buy the dog food formula that fits your breed's classification ranging from working dogs to athletic dogs, and this formula is packed with animal-based proteins to help your dog build up their muscle mass. Your dog will also get a high dose of calcium with every meal to help support their bones and joints, and it also helps to protect your dog's teeth. You can buy three different sizes with this food, and it has a high dietary fiber content to help your dog absorb more nutrients from their food, and the fiber also promotes healthy digestion. You'll get a satisfaction guarantee when you buy this food, the kibble pieces are slightly smaller so your dog can easily eat it. Dog parents who bought this brand were pleased that it contains a higher amount of protein and dietary fiber to promote healthy weight gain, and they were also pleased that it works to reduce plaque on their dog's teeth. They weren't pleased that this food only came in two formulas with no choice over which flavor the food is. When you buy this dog food, your dog will get 36-percent crude protein, 15-percent crude fat, and 5-percent crude fiber to support healthy digestion, nutrient absorption, and weight gain. Along with the higher protein count, this food also has enzymes and probiotics to support digestive health, and the formula doesn't have any synthetic minerals or vitamins. This food also contains no corn, lentils, peas, soy, wheat, rice, sweet potato, or fillers because these can cause digestive upset and weight loss if your dog has sensitivities or allergies. This dog food brand sources quality ingredients and it contains multiple proteins that make it easy to rotate or switch them out if your dog doesn't like it. Dog parents were happy that this dog food formula has a very high crude protein content, and that it has enzymes and probiotics to support digestive health. Dog parents weren't happy that this formula only came in three different smaller sizes, and they also weren't happy that pickier dogs seem to avoid eating it. 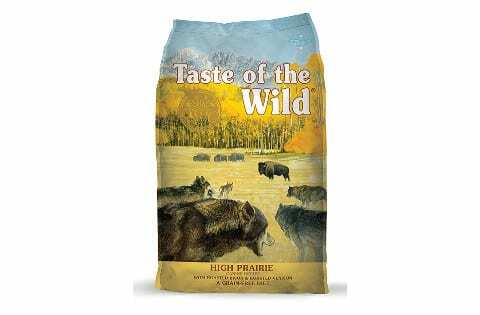 Our pick for the best dog food with a high calorie content is Taste of the Wild Grain Free High Protein Dry Dog Food because it has meat from a real protein source as the first ingredient listed on the label. 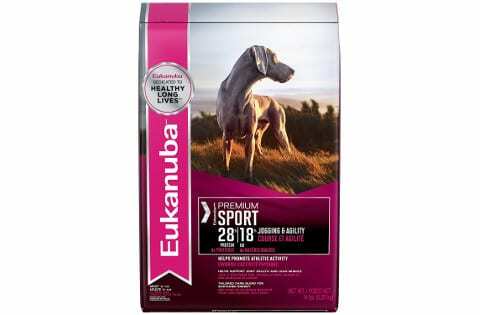 This food also has antioxidants, minerals, vitamins, probiotics, and amino acids to support your dog's complete health. There is no grain, corn, wheat, or fillers either, and this makes it very easy for your dog to digest. Finally, this food comes in several different sizes and flavors that make it easy to customize the food to your dog's tastes and dietary needs.